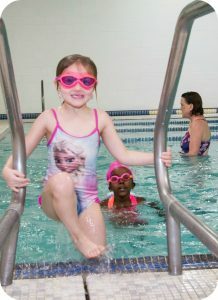 At the Attleboro Y, we understand that swim lessons are more than just stroke development. As they learn to swim, children also develop endurance, self-confidence, and an appreciation for water safety. The Y staff works hard to create an encouraging atmosphere in the water, where each swimmer can learn and progress at his or her own rate and comfort level. With the Y’s programs, you can start swimming with us at any time during the year! Please register 5 days in advance of your first class. Programs are billed monthly, so you can continue for as long as you like. Simply give us a week’s notice when the class no longer fits in your family’s schedule. In this parent-child category, children learn to be comfortable in the water. Swim Starters focuses on developing swim readiness skills through fun and confidence-building experiences. 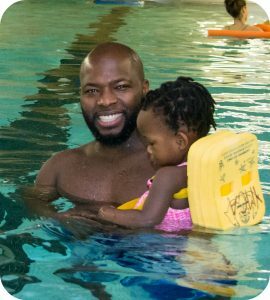 Parents also learn essential skills in Swim Starters, including how to best supervise children in the water, how to prevent accidents, and how to plan for emergencies. Introduces infants and toddlers to the aquatic environment. Focuses on exploring body positions, blowing bubbles and fundamental safety and aquatic skills. Increases comfort with underwater exploration and basic self-rescue skills performed with assistance. While using flotation device, swimmers will learn to swim independently in correct body position, become comfortable getting face wet, floating on back and jumping into the pool without assistance. Encourages forward movement in water and basic self rescue skills performed independently. Swimmers in this level swim independently with flotation device, get their face wet, and jump in and exit pool without assistance. Swimming in correct body position, forward movement, back gliding and safety skills will be emphasized. Develops intermediate self-rescue skills performed at longer distance than in previous stages. At this level, students swim without a bubble or with only a single slice flotation. They will learn to swim in a correct prone front position with face in the water and back glide 10 yards without bubble. This class builds endurance to swimming on front one length of the pool without flotation device and develops stroke technique on front and back. 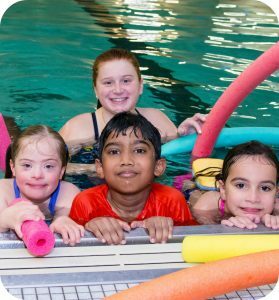 In these three stages, having mastered the fundamentals, students learn additional water safety skills and build stroke technique, developing skills that prevent chronic disease, increase social-emotional and cognitive well-being, and foster a lifetime of physical activity. Introduces basic stroke technique in front crawl and back crawl and reinforces water safety through treading water and elementary backstroke. Rhythmic breathing & flutter kick will be practiced. Introduces breaststroke and butterfly. Reinforces water safety through treading water and sidestroke. The four competitive strokes and sidestroke will be taught. Participants should be able to swim length of pool with proper rotary breathing before joining this class. This introduction to competitive swimming refines stroke technique on all four competitive strokes, builds endurance, and encourages swimming as part of a healthy lifestyle. These 30-minute classes have smaller student-to-instructor ratios to help acclimate children with special needs to the water and teach them basic swimming skills. Parents and/or aides are welcome to get in the water to help during the class. The Y staff will be happy to work with you and your family in small groups or individually. Contact the Aquatics Coordinator at the Downtown Branch or the Pleasant Street Branch to schedule your lessons. Boy Scouts and Girl Scouts troops are welcome to come to the Y for structured badge or pin training followed by recreational swim time with the family. By appointment only. Contact Kelly Mahoney at kmahoney@attleboroymca.org or (508) 409-0768 to schedule your troop’s session.